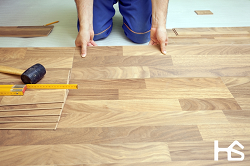 Our floor installers have extensive experience laying various types of flooring. Taking care of all the small things are what makes a flooring job look satisfying and complete. All baseboards, door openings, closets and other challenging areas will be neatly finished with the utmost precision. We can help recommend what type of flooring, underlay, or sub-flooring that will be best suited for each area of your home. Basements, Bathrooms, Kitchens require a flooring specialist to have specific flooring and home contractor knowledge to ensure your investment is installed correctly. Putting hardwood flooring in your basement for instance is almost certainly a bad mistake. Let us help you with your new hardwood floor, laminate, bathroom tile, or carpet installation, design and selection. We are licensed, insured and carry WCB coverage. ​Wood floors are prone to movement mainly due to the rooms humidity level. If installed correctly, floorboards hold tight to one another during increased humidity and might reveal gaps during drier times. Abnormal gaps are generally the result of installing wood floors that have a high humidity percentage, or installing a floor during low humidity times. Floors will also expand or contract a great deal due to other factors such as installing them over a heating duct, areas that receive a lot of sunlight, or rooms that are heated with wood burning appliances. If your home home always has a high amount of humidity, installing floors may not be your only problem. You likely have other issues that could be producing mold growth in your home. Have one of our Home Professionals help you identify and rectify any problems your home might have. It's a good idea to have a flooring specialist identify factors that could contribute to complications due to a poor product, or location choice. Home Service Pro's Flooring Specialists are here to assist you with your new floor from start to finish. ​Floor tiles are commonly made of ceramic, stone, or porcelain. In recent years, tiles are also made from glass, rubber and even plastic. Digital imaging can be scribed onto the tiles to create custom patterns. Floor tiles are generally set into a thin set and the joints are mortared. Ceramic tiles are composed of clay, minerals and water that have been fired at high temperatures. These tiles can be finished with a glaze or left non glazed. A glass glazed finish will help prevent substances from entering the pores that would otherwise cause stains. Glazed tiles generally more fragile, and thus should not be installed in high foot traffic areas. Non glazed ceramic tiles tend to have rich colour all the way through. It is recommended to treat this tiles with a product to help resist stains. Natural stone or natural rock tiles can be stained by spilled liquids. They must periodically be sealed and resealed with a sealant in contrast to tiles that are ceramic only need their grout lines sealed. However, because of their complex patterns, small amounts of dirt will rarely show. Rock tiles can be beautiful but as a product that is natural are less uniform in color and pattern, and require more planning for installation and use. Mass produced factory stone tiles are uniform in width and length. Granite or marble tiles are cut on both relative sides and then polished or finished on the surface that is top that they have a uniform thickness. Other stone that is natural such as slate are split on the surface at the top. The thickness of the tile varies slightly from one spot on the tile to another and from one tile to another. 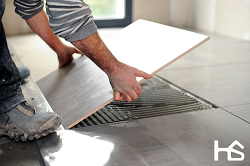 Variations in tile thickness can be handled by adjusting the amount of mortar under each part of the tile, by using grout that is wide that "ramp" between different thicknesses, or by using a chisel that is cold knock off high spots. Some natural stone tiles can have a smooth finish, and therefore can be slippery. The surface can be re finished with sand or scuffing to create more traction and prevent slipping. Smaller tiles can be installed so that the grout between the tiles acts as a form of traction.. The hardness of natural rock tiles varies such that some of the softer rock tiles are not suitable to areas with heavy foot traffic. On the other hand, ceramic tiles typically have a surface that is glazed is upper when that becomes scratched or pitted the floor looks worn, whereas the same amount of wear on natural stone tiles will not show, or will be less noticeable. Porcelain tiles are in the same family as ceramic tiles. The difference is that to be branded as "Porcelain", the product had to go through testing to ensure that it does not hold a lot of moisture. In order to be moisture resistant, Porcelain tiles are made with fine particles that are tightly packed together. Because of it's tight structure, Porcelain tiles are very durable and thus can be used both indoors and outside. They are the perfect choice for heavy foot traffic areas. Some companies have selections that simulate natural stone. The manufacturers scribe digital images into the porcelain tiles to create a wide range of natural looks. The downside of porcelain, is that they are very hard and hard to cut therefore making installation a little bit more labour intensive. Rubber floor tiles have a variety of uses, both in residential and settings that are commercial. They are especially useful in situations where it is desired to have floors that are high-traction protection for an floor that is easily breakable. Some common uses include flooring of garage, workshops, patios, swimming pool decks, sport courts, gyms, and dance floors. Plastic floor tiles can be interlocked and therefore can be installed without an adhesive. These types of tiles are a recent innovation and are suitable for areas with heavy foot traffic, wet areas and floors that are subject to movement, high moisture or other substances that may prevent adhesion to the sub floor.